Remember When Jeb Bush Wanted to Abandon “Nostalgia” for Reagan? This entry was posted on Monday, February 13th, 2012 at 10:45 and is filed under Bush Clan, Conservatism, Election 2012, GOP Establishment, Media, Mitt Romney, News, Politics. I try not to be unduly inflammatory when discussing other Republicans, but these remarks, as published in the Washington Times back in May 2009, serve to remind me of why I don’t think much of Jeb Bush. Saturday, in stark contrast throughout a speech that stirred CPAC to multiple standing ovations, Sarah Palin mentioned Ronald Reagan, and alluded to him as well, but I suppose that in the minds of Mitt Romney and Jeb Bush, she’s just “living in the past,” like so many conservatives. The thing that crosses my mind as I consider his arguments of nearly three years ago is that what he then proposed was absurd, and as time goes on, his thesis grows only more obnoxious in my view. How can it be said that Ronald Reagan is irrelevant if he still evokes the sort of passion we saw in the crowd’s reaction to the mention of Reagan’s name throughout the CPAC convention? Maybe his problem is that the name “Bush” does evoke similar nostalgia. “So our ideas need to be forward looking and relevant. I felt like there was a lot of nostalgia and the good old days in the [Republican] messaging. I mean, it’s great, but it doesn’t draw people toward your cause,” Mr. Bush said. Here was a former governor of a pivotal state in presidential elections, whose father and brother both boasted of their ties to President Reagan as a matter of their campaigns, and yet now we should ditch all of that in favor of what? A Bush dynasty? Is that the legacy of the party to which we should now point with reverence? Please. Here is a man who tells us this as he sat alongside Mitt Romney who had been defeated only one year before, and he bothered to tell us who he thinks is no longer relevant? Please. Then I consider that Jeb has been out of office for a good little while himself, and then I consider that isn’t Mitt Romney’s clinging to him merely a nostalgic reach back to an earlier time? Of course, one wonders if Jeb remembers that Mitt said “I don’t want to return to Reagan/Bush.” In any case, for the GOP establishment to continue to attempt to ditch Ronald Reagan and his principles is one of the worst political moves they could make, and the sort of statements they make publicly help cement the notion that they’re not really conservatives. There has been this sentiment withing GOP establishment circles almost before Reagan left office, and it’s based on the fact that they really didn’t like Reagan any better than the left did, but since he was overwhelmingly popular with conservatives, they decided as a matter of expedience to ride on his legacy. The problem is that they don’t believe in it, and they have a bit of a grudge too. Those around George HW Bush believed then and now that if only the elder Bush had been elected instead of Reagan in 1980, he would enjoy that position of favor with the American people. Naturally, that’s a preposterous proposition, and it assumes a great deal. For instance, the elder Bush would have cautioned against the Berlin Wall speech, as delivered, and he wouldn’t have been likely to walk out on Gorbachev at Reykjavik, Iceland. This is part of the problem a fair number of conservatives have with the Bush family: There’s a sense that they believe it is their role to be stewards of the party, and the nation, irrespective of whether the American people agree, and they always conclude that we would be better off forgetting Reagan in favor, I suppose, of one of their family. At this point in history, however, I think most Americans, and perhaps particularly conservatives, simply aren’t in the mood for any more from the Bush family. While Jeb Bush may have created a cult-like following in some segments of Florida politics, that doesn’t extend to the national stage, and given the performance of his father and his brother, both social liberals when examining their respective domestic policies, it’s clear that conservatism simply isn’t in the market for more of that in its next leader. Perhaps rather than suggesting that we should abandon the Reagan legacy, or that we should cease looking for his logical, philosophical, and political heir, the Bush family might wish to consider that they’re a bit stuck in a past when their opinions mattered to conservatives, when we still thought there had been a chance they might be more like us. After twelve years of Bush presidencies, I don’t know a single conservative, not one, who seriously suggests that Jeb Bush is the direction we should look for national leadership, although there is no shortage of Bush clan sycophants who can’t wait to push that theme. Such is the legacy of Bush presidencies, and it is why I look askance at the proposition that we should ditch the legacy or “nostalgia” for Ronald Reagan. My question is ever: “To be substituted with what?” Clearly, Jeb Bush has his own ideas, but I don’t think a large number of people outside of Florida share them. More, I don’t believe he wants us to look all the way back to Ronald Reagan, because I think he fears how much the records of his brother and his father will suffer in the inevitable comparisons. Modern conservatives are not really enamored with political dynasties, and I think it’s clear that the nation is suffering Bush fatigue that will not be softened much or soon. Of course, the Bush family seems to know this, as they continue to groom a younger generation for eventual political offices, like Jeb’s eldest son, George P.G. Bush. Whether the American people will ever accept another Bush presidency is unknown, but one thing is clear: If conservatives are polled on which President for whom they consider worthy of nostalgia, it isn’t a Bush. As CPAC’s event demonstrated clearly last week, it’s still Ronald Reagan, who was clearly the most-referenced figure from American political history. 3 Responses to Remember When Jeb Bush Wanted to Abandon “Nostalgia” for Reagan? We have had a few father and son Presidents which is a repeat in history However three of the same family starts to look like an attempt to a dynasty. I think the same way you do about the Bush family, and I was disappointed to learn they are grooming another generation. 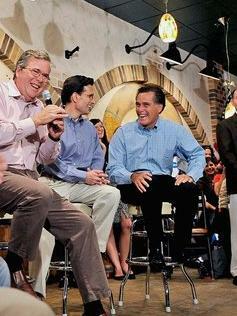 At first I thought they wanted Romney to win the nomination and lose so that they could nominate Jeb Bush in 2016. Then I thought they are working for a brokered convention so that Jeb could be a dark horse. I went to my district caucus and got my self elected as a secretary and as a delegate and I intend to try to hold on to my delegate status all the way up to the National Convention, and I promise you I will never support Jeb Bush as a dark horse. Sarah? In a heart beat! Is it the Bush family who are trying to keep Sarah sidelined? I am so glad she included a defense of the Tea Party patriots in Congress in her keynote speech a CPAC and I have enjoyed imagining the look on some faces when Sarah said "and this time, ESTABLISHMENT, we expect them to be given leadership positions"